It's a man! With a ferret on a lead! In Covent Garden! A common sight in Parisian parks. He must be French. Or mental. Yes, but does he stuff it down his trousers? > It's a man! With a ferret on a lead! 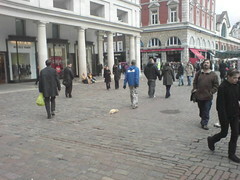 In Covent Garden!